Thread: Hypothetical large-scale algae cultivators? I am working on a project regarding a space settlement, and I must work on a chapter related to the nutrition of the settlers. It seems that algae is used as food in a lot of cultures, especially in Asia, but I'm unsure if growing algae is space- and resource-efficient. The fact that it doesn't require soil is attractive, so is the controlled environment. I also read that they grow pretty fast. 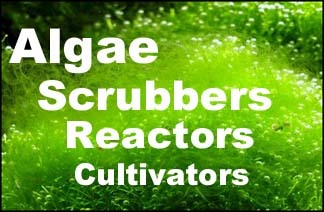 What size should an algae cultivator be to produce about 6 tons a week? How deep/wide/long should it be? Any insight will be appreciated. Seaweed (algae) can do a lot for air, and has even been looked to support life in space: “Algae hold the potential of carrying out most of the major functions of life support, i.e. the production of food, oxygen and water, and the removal of carbon dioxide. The advantages of algae are their rapid growth, controllable metabolism, high harvest index, and their gas exchange characteristics that are compatible to human requirements.” -- Parametric Model of a Lunar Base for Mass and Cost Estimates, by Peter Eckart. For your situation, it the 6 tons wet or dry? Well I suppose...dry? That's the ammount we would need for a meal, which i approximated at 500 g. I'm not familiar with how algae is served. We also took into account the benefits brought by the gas exchange. I'm sure that's wet weight. Well a 2-cube size scrubber/cultivator can handle 42 grams input of condensed wet food per week; the output (algae) would be fluffy and more stringy, so you can get up to 100 grams a week of wet growth. It would take five of these 2-cube units to make the 500 gram meal per week. 6 tons = 5,400,000 grams = 54,000 of these 2-cube cultivators; each cultivator (if a bubbling upflow) would be 75 sq cm = 0.0075 sq m.
A realistic size however for each cultivator would be a square meter, which would be 133 of these small units. Thus each square meter would make about 25 meals per week = 12,500 grams wet. So the 6 tons would be 432 square meters, or 432 cultivators of 1-meter each. A row of 40 by 10 cultivators = 400 would be a good start. Very important though, is the storage of water and nutrients. That's a different area of concern altogether and would depend on the systems being used. Thanks a lot! We'll take care of the technical parts a bit later, such as nutrient production, storage and reciclation. So far we are just working on the bulk. Do you have any recomandation on what kind of seaweed to grow? I made a short list based on the ones that are said to be the best from a nutrtion stand-point, but I never actually tasted any food related to algae. Also, do you think it is worth growi g microalgae like spirulina for the sake of allimentary supliments, like protein pills? Edit: how deep is a cultivator? Do you happen to have a link towards a picture of one? If you are seeding it from sterile, on the moon, then you could choose a species; on earth you can't as easily because it will grow based on conditions. But I'd choose sea lettuce: Ulva Fasciata. Micro however is totally different and you probably don't want to mix the two. Compared to other foods and crops, any green algae is a "super" food, and is better than starving, so selection based on nutrition is probably not as important as based on ease of growth and harvesting. They are bland tasting, like lettuce, so you season them to taste, or mix with other foods. An upflow cultivator only needs air bubbles beneath some attachment strings, like our Surf models. Just harvest with a big salad fork. I don't have any calculations of how much oxygen or CO2 they process per unit mass though, because that info is not needed for aquariums.